Winter might limit some activities due to the cold dark days but there are some essentials that make the elongated staying home routine fun and pampering. I am referring to the skincare essentials, treating the skin to the much-needed moisture due to the indoor heating, outdoor cold weather. 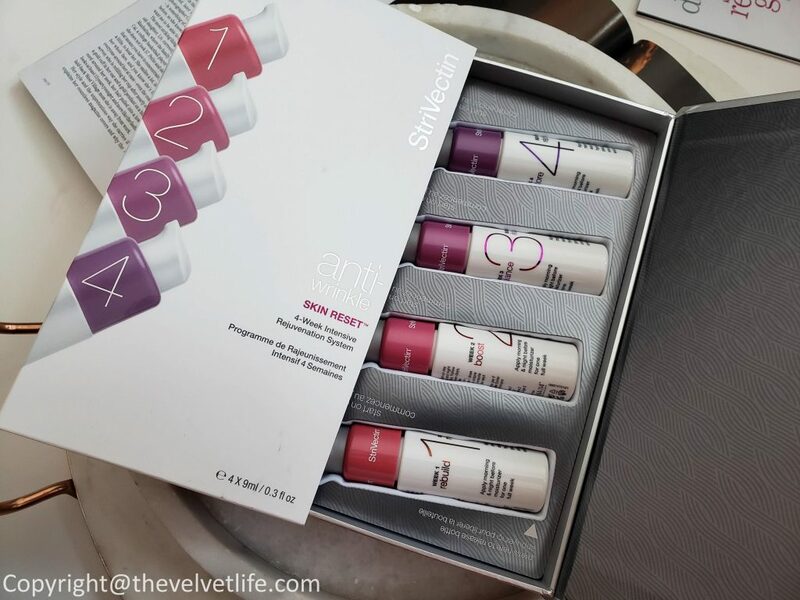 There are two new launches from StriVectin that are not only amazing for pampering the skin but also to help to get ready for the spring. StriVectin Blue Rescue Clay Renewal Mask and Skin Reset 4-week Intensive Rejuvenation System. 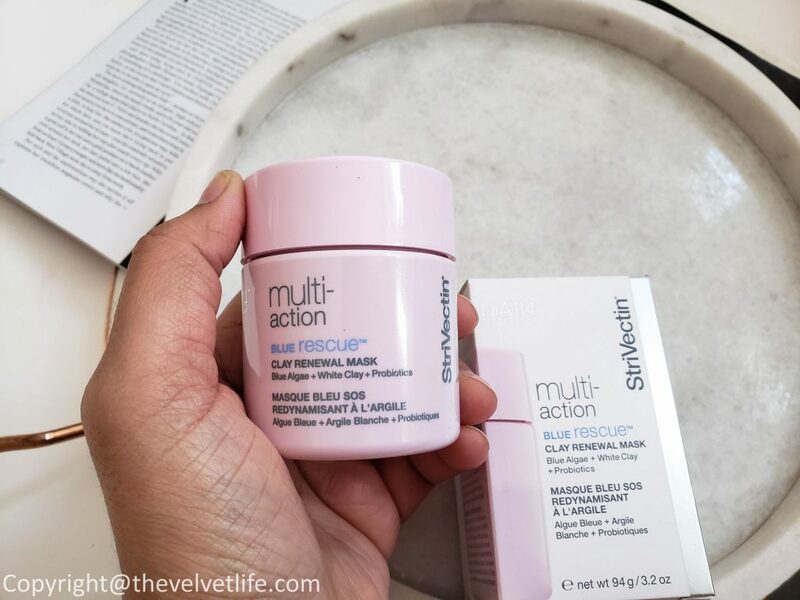 StriVectin Blue Rescue Clay Renewal Mask is a massage activated, color transforming clay mask. This is not my first massage activated color transforming clay mask, I have used one in the past and really like the concept. With the massage, first there is a physical exfoliation, and then the color of the mask changes from white to blue. 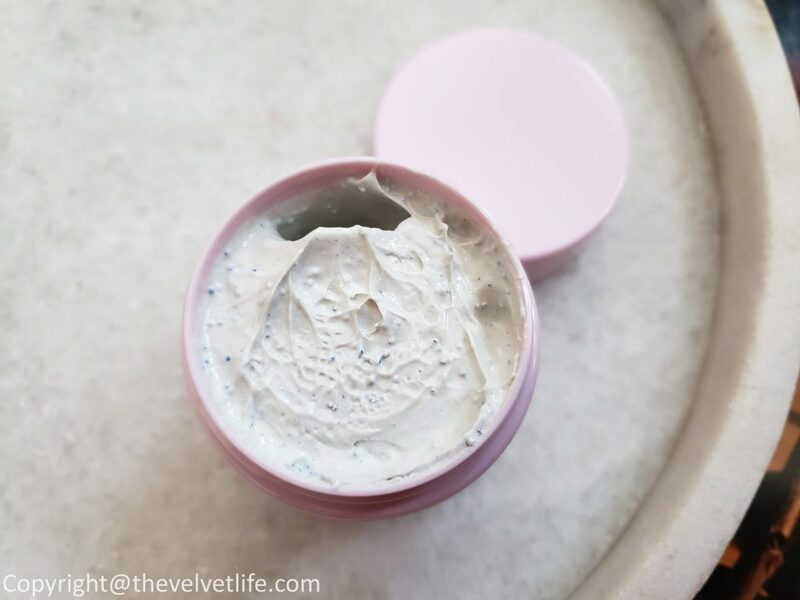 Any typical clay mask might dry the skin, but I did not feel any dryness on my skin neither any irritation with this mask and the exfoliation. My skin feels nourished, hydrated, balanced with the small pore size, comfortable, and radiant. This is exactly what I expect from a mask, especially for my combination skin. I did feel it helped my congestion clear out fast. I did test this mask for over few weeks sometimes weekly or bi-weekly. The formula is encapsulated Blue Algae Extract and pigments activate upon application, transforming from white to ocean blue color as it renews skin and boosts radiance. To use, apply evenly to clean, dry skin avoiding the eye area. Gently massage in a circular motion until the mask transforms from white to blue. Leave on for 10 minutes, then rinse off thoroughly and follow with the rest of your routine. WEEK 1: rebuild by restoring optimal, lasting hydration – visible luminous, hydrated skin, signs of dullness and fatigue are eliminated as hydration levels improve. WEEK 2: boost skin to improve elasticity & visibly relax fine lines and wrinkles – Skin feels softer, smoother and more nourished. WEEK 3: balance skin for a radiant, even-toned complexion – skin feels firmer and more toned. WEEK 4: restore resiliency & improve the look of sagging skin & deep wrinkles – skin will appear smooth, soft & plump, healthy-looking tone and texture, and totally rejuvenated results. 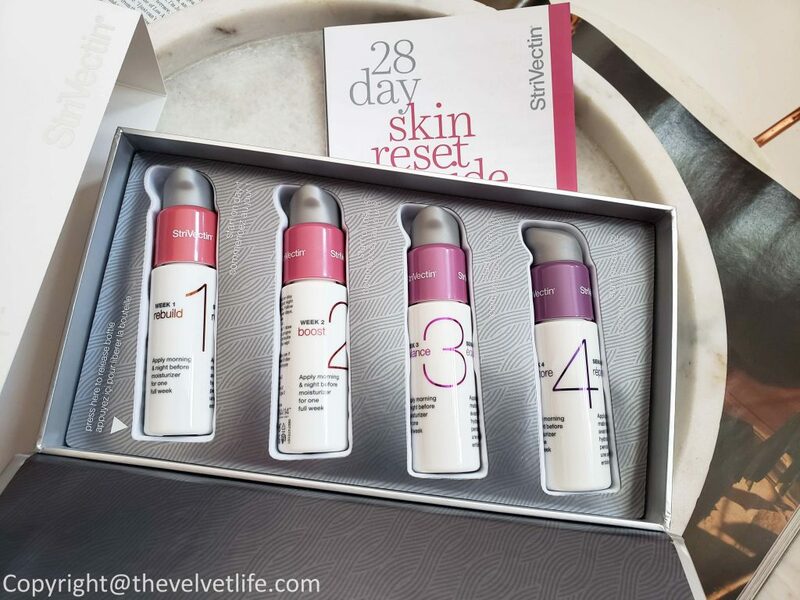 To use, over the month, each week’s Reset serum formula is to be used as the daily serum—after cleansing and before moisturizing. At the end of four weeks, regular skincare routine can be resumed but is recommended to stick to the routine. I have not used this system for the time recommended, which is 28 days continuously but my initial thoughts for the few days, I went up to completing over 2 weeks and moving on to the third week now. Based on my skin’s needs, like congestion I do add up toner or layer the serums. 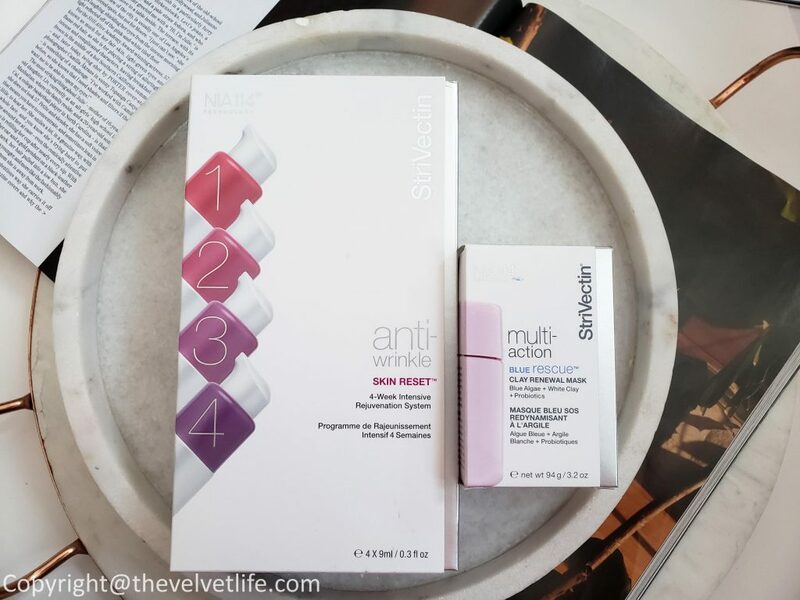 I have both the new launches from the brand in my skincare routine and really liking the results.